After eight years of running for president, Mitt Romney has yet to master the geography of the Middle East. His knowledge appears limited to what he sees from his hotel room in Jerusalem, following the example of Sarah Palin, who is reputed to have said she understood Russia because she could see the country from her back porch. To paraphrase Ann Richards’ memorable reference to George Bush the First, in her 1988 Democratic National Convention keynote speech, “Poor Mitt, he can’t help it, he was born in a country that has abandoned the study of geography”. In the wake of the recent presidential election, an increased level of interest has surfaced in this country over foreign issues. While domestic economic issues arguably dominated the political scene, both candidates were repeatedly asked questions about Iraq, Afghanistan, Pakistan, North Korea and all of the other so-called rogue nations. . . .
[Unfortunately,] The education system in this country has never done a satisfactory job in pushing geographic knowledge. Just as U.S. students are losing ground in the international education rankings, so too is geography falling completely off the map in secondary education. Sad to relate, that analysis appeared four years ago on December 10, 2008, following the last presidential campaign in which Mitt Romney sought, but failed to gain the Republican nomination. Four years later, the Republican nominee is back, still lacking a basic grasp of Middle East geography. This time, however, the candidate is his party’s nominee, traveling around the country (and to Israel) informed by a team of advisors, 17 out of 24 of whom are from George W. Bush’s presidency. Now that there is close to a 50% chance that Romney will become the next president of the United States, this basic lack of knowledge by Romney, and worse, his refusal to learn the facts about the area of the world which is at the heart of our economic and security woes, is at the very least, troublesome. Romney’s geographical ignorance surfaced once again this week when the candidate said during his third debate with President Obama,”Syria is Iran’s only ally in the Arab world. It’s their route to the sea.” The map above refutes that assertion. Study it carefully, and pray that if Romney becomes president, he will also look at it carefully. During last night’s foreign policy debate, Romney said: “Syria is Iran’s only ally in the Arab world. It’s their route to the sea. In fact, Iran, a close ally of Bashar al-Assad’s regime, has direct access to international waters through its large coastline on the Gulf and is not even a neighbour to Syria in order to rely on it as a route to the sea. Instead, Syria gives Iran a physical access to Lebanon and its Hezbollah militia which is strategically important for Tehran leaders because of the group’s geographical position in respect to Israel. It is not the first time that governor Romney has referred to Syria as a country that provides Iran with a route to the sea. In March, Romney made the exact [same] gaffe at AIPAC conference. “Maybe one of the few bright spots in the Middle East developments in the last year has been the rising of the people in Syria against Assad. Obviously, as you know, Syria is Iran’s only Arab ally in the region. Syria is the route that allows Iran to supply Hezbollah with weapons in Lebanon. Syria is Iran’s route to the sea,” he said, according to the Washington Post, which fact-checked his remarks back then. What this Romney observation says about the candidate is that he is simply not ready for foreign policy prime time. During the Monday night debate, veteran journalist Robert Parry, writing for Consortium News, points out that Romney’s goal was “to downplay his warlike neoconservative stands”. The “route to the sea” comment – with its faint echo of a distant time in geopolitics – represented proof that Romney lacks even a rudimentary knowledge of world geography, since much of Iran’s southern territory fronts on the Persian Gulf and Iran could only reach Syria by transiting Iraq. Syria and Iran have no common border. In short, Romney’s foreign policy is not complicated. It is simply “make the Middle East Israel-friendly”, the Bush-era neoconservatives’ mantra. That mantra requires that Romney cling to what Parry calls, his “peculiar sense of geography”, which gives him the freedom to keep thinking, and saying that “Iran was some landlocked country that needed Syria as a ‘route to the sea’.” The route phrase has a nice poetic feel to it. So what if it is factually incorrect? Why should Romney learn Middle East geography? If he reaches the White House, Romney’s primary foreign policy advisor, Dan Senor, a Bush era holdover, will get his marching orders from Tel Aviv. Senor knows how to take orders. He was the U.S. public relations officer in the early days of the Iraq occupation. Public relations people know they must tell the public what the bosses want people to hear. Who need geography when you have Dan Senor serving as minister of the department of “make the Middle East Israel-friendly”. And speaking of government ministers, here is one more thing before we enter the final week of this campaign. It is an insight that comes from the British-oriented cultural world of Harry Potter, where “ministers” of governments run things. Who better to report on the American foreign policy debate than a Potter authority, who is, naturally, from the prime audience J.K. Rowlings had in mind when she wrote the Harry Potter books. Writing in Slate, Katie Rolphe reports that her “Harry Potter-obsessed 9-year-old” daughter watched the Obama-Romney foreign police debate ” entirely through the lens of Harry Potter”. Of course, Romney is Dolores Umbridge. The former governor and Bain corporate executive was just one of the Republican pack of conservatives running for the nomination, until the Republican big money donors decided he was the most pliable candidate and rallied behind him. He has not been on top long enough to develop a public image, which is why it is easy to link him to an established cultural figure like Professor Dolores Jane Umbridge (above). 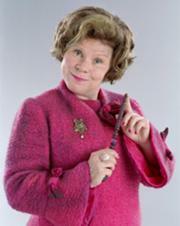 For those unfamiliar with the Potter phenomenon, here is what you need to know about Dolores Jane Umbridge. Madam Undersecretary Professor Dolores Jane Umbridge was a witch and Ministry of Magic bureaucrat who served as Senior Undersecretary to the Minister for Magic under Ministers Cornelius Fudge, Rufus Scrimgeour and Pius Thicknesse. By order of the Ministry, she was installed as Defence Against the Dark Arts Professor at Hogwarts School of Witchcraft and Wizardry, and then later Hogwarts High Inquisitor and Headmistress. In all three of these positions at Hogwarts she had enormous power over the students, teachers, and the curriculum, which she wielded despotically. Umbridge and Romney have several things in common. To start, in Harry Potter’s world, Dolores Jane Umbridge served as Senior Undersecretary to the Minister for Magic. Of course, Romney knows all about magic. Refusing to give details of his tax plan; refusing to release his own tax returns; pretending to embrace Obama’s foreign policy in front of 59 million television viewers, Romney was doing what magicians do, fooling the audience with sleight of hand. His followers loved it. Good old moderate Mitt, keeps the magic to himself. “No, she said, impatiently. Like why can’t I see it? Why am I not receiving the message the universe is so clearly sending? Dumbledore! 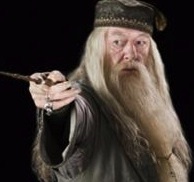 Wise, old, snowy-haired Albus Dumbledore (above). He has moral authority and gravitas, even when life at Hogwarts moves out of his control. Take it from Katie Rolphe’s nine-year old Potter authority, this election will be a choice between Dolores Jane Umbridge, former Senior Undersecretary to the Minister for Magic and “wise, old [in experience], snowy-haired Albus Dumbledore”, who posseses “moral authority and gravitas, even when life at Hogwarts moves out of his control”. No question but that life in Barack Obama’s Hogwarts is constantly shifting “out of his control”. But at least Obama can find Iran and Syria on a map. This entry was posted in -Movies and politics, Middle East Politics, Movies, Netanyahu, Obama, Politics and Elections, Romney. Bookmark the permalink. Obama may be able to find Syria and Iran on the map, but he is not the peacemaker for whom the world yearned in 2008 and is more crucial now! Instead Obama is a drone killer! Posting on Facebook. Thank you. Although Mr. Obama was a great disappointment, especially for us in the Palestinian Occupied Territories, the alternative could be a disaster. If the US is determined to maintain the status of a super power, with the determination to run world affairs, it certainly needs a leader with some intelligence and who knows his geography. Important points, Jim, and I love the Harry Potter references! I have long thought Israel’s leaders and apologists have collectively exemplified the character of Dudley Dursley, Harry’s only cousin. In the first book Harry is relegated to in a cubicle under the stairs in the Dursley home where Dudley, spoiled since birth yet constantly throwing tantrums because he’s never satisfied, can convince his parents of anything he wishes to blame on Harry. Dudley’s clueless, doting parents? Our successive U.S. adminsitrations! instead of those who sarrounded themselves with a wall of Apertheid. His campaign is neither democratic nor patriotic. should be spent on improving the livelihood of the 47% that Mitt Romny does not acknowledge as full fledged Americans. put obstacles against his foreign policy.. Mitt Romny’s poor score in geography will not earn him a platform as peace seeker or broker. Might is never equal to Right. Wake up America and vote for America First. Thanks for a great article. I like your use of the quotation,”Make the Middle East Israel-friendly”. This must be the core of American foreign policy, as designed by UnAmerican Zionist ideology, currently implemented by Republican and Democratic candidates. They do not look out for America, first, but rather for the expansionist Apartheid Zionuist state. It seems to me that Romney’s worst subject is NOT “Geography”, as bad as that is, indeed. I see his worst subject as, “History”. Romney did not learn anything from “History repeats itself”. Here he is watching Israel with awe, outsourcing American National security and foreign policy to Israel, forgetting that powers that occupied other countries and enslaved other people were denounced, condemned, resisted, fought, and defeated and left to rot in the trashbin of history. Israel will not remain as the Zionist state it is today. It will have to renounce and repudiate its Apartheid foundation, militancy, expansionism, nuclear arsenal, usurpation of Palestine, and it will have to make room for the Palestinian people that Israel dispossessed. Jim, thanks for another great blog. Re Rmoney’s distorted and ignorant sense of geography, I’m probably not making any revelatory statement here (although I haven’t noted it anywhere else), but I believe that Rmoney simply confused Russia with Iran in his reference to “its (Syrian) route to the sea.” Russia does indeed have a warm-water seaport (I think it’s Tartus) in Syria for advantageous use. I think a very big question is: Why weren’t Rmoney’s advisers sharp enough to tweak up his “briefing binder” immediately after he made the initial gaffe confusing Russia with Iran? If my supposition or facts are wrong, I welcome correction/clarification. Naim and Saleem Ateek are personal friends of mine–I respect what they have done and continue to do for Sabeel and Christian Palestinians. I tire of the snarky comments by Jim Wall–he said he was retiring–it is LONG overdue. His election would only bring us, our children, and our children’s children, trouble around the globe. Barak Obama, for all his weaknesses, has already gone a long way to restore America’s reputation which was destroyed by the neo-cons during the second Bush administration. Obama deserves our confidence, and support. “You know Mitt, you could do with a Map of the World on your wall.